Offering a 24-hour fitness centre and free Wi-Fi, Hampton Inn Bridgeville is 2.5 km from Great Southern Shopping Centre. All rooms include a flat-screen satellite TV with premium channels, a microwave and refrigerator. A desk and ironing facilities are also available. Free hot beverages and a 24-hour concierge service are available in the lobby. A 24-hour business centre is also provided. The Bridgeville Hampton Inn provides a complimentary hot breakfast each morning. A variety of dining options including Tambellini Italian Bridgeville Restaurant and Sauce which serve American fare are less than 5 minutes’ drive. A variety of parks, golf courses and several outdoor activities are nearby including the Alpine Hunting and Fishing Club which is 5 km away. Pittsburgh Airport is only 18 km. 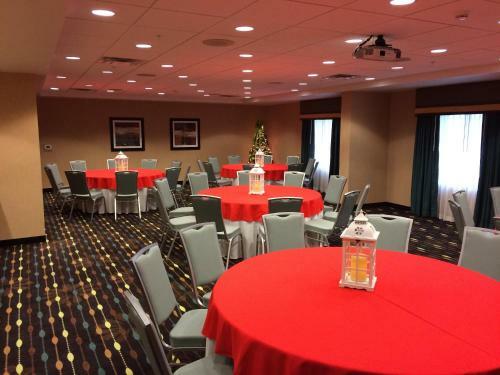 the hotel Hampton Inn Bridgeville so we can give you detailed rates for the rooms in the desired period.